?Neurosurgeons at UC San Diego Health have initiated a landmark, multi-center study to evaluate how the treatment of brain tumors using the NeuroBlate system, a minimally invasive, FDA-approved laser device, impacts the quality of life of patients. Clark C. Chen, MD, PhD, neurosurgeon, UC San Diego Health. The prospective study, called Laser Ablation of Abnormal Neurological Tissue using Robotic NeuroBlate System (LAANTERN), is funded by Monteris Medical. The study is designed to collect patient outcomes data for laser interstitial thermal therapy, a technique that uses laser energy to destroy brain tumor tissues. The UC San Diego Health neurosurgical team is the first in the nation to enroll patients in LAANTERN. To date, patients have been discharged home a day after treatment and resumed daily activities. Quality of life factors such as physical, social, emotional and functional well-being are measured as well as how well the symptoms of disease were controlled or eliminated. Chen described the surgical procedure as requiring a tiny, less than 5 millimeter skin incision and a similarly sized opening in the skull through which a laser probe can be inserted directly into the tumor to destroy abnormal cells. 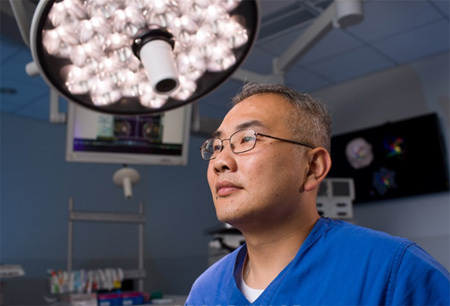 “As a truly minimally invasive surgery, I anticipate that the quality of life of the laser-treated patients to be significantly improved relative to conventional surgeries where large incisions are made and significant portions of skull are removed,” said Chen. Chen added that while the initial results of the study are promising, it is important to keep in mind that the clinical results of new technologies need to be carefully monitored and recorded until the study is complete. The laser treatment requires real-time MRI monitoring and a dedicated intra-operative MRI team. The procedure cannot be performed in a conventional operating room. “We are proud to be the only neurosurgery facility in the region with the capacity to support this advanced form of minimally invasive neurosurgery,” said Bob S. Carter, MD, PhD, chairman of the Department of Neurosurgery at UC San Diego Health. UC San Diego Health is an internationally recognized leader in minimally invasive neurosurgery. Chen is a pioneer in minimally invasive endoscopic surgery and MRI-guided laser treatment. He is actively seeking collaborations with industry leaders to develop complementary and avant-garde technologies for the treatment of brain cancer. Monteris Medical is a privately held company developing devices for minimally-invasive, MR-guided neurosurgery.